Lafayette County, Missouri; date? Permission of John August Lefman; all rights reserved. Wilhelm Friedrich Fiegenbaum (in the middle) had married Henriette Caroline Amelia Starkebaum in 1893. She is not in this picture. Wilhelm Friederich Starkebaum (on the right) was Henriette C. A. Starkebaum's brother and thus a brother-in-law to Wilhelm Friedrich Fiegenbaum. Emilie Friederika Elise Starkebaum was Henriette C. A. Starkebaum's sister. She is not in this picture. However, in 1911 she married Friederich Herman Tempel (on the left). That made Friederich Herman Tempel a brother-in-law to both Wilhelm Friedrich Fiegenbaum and Wilhelm Friederich Starkebaum. Of course, the brother-in-law relationship works in both directions. 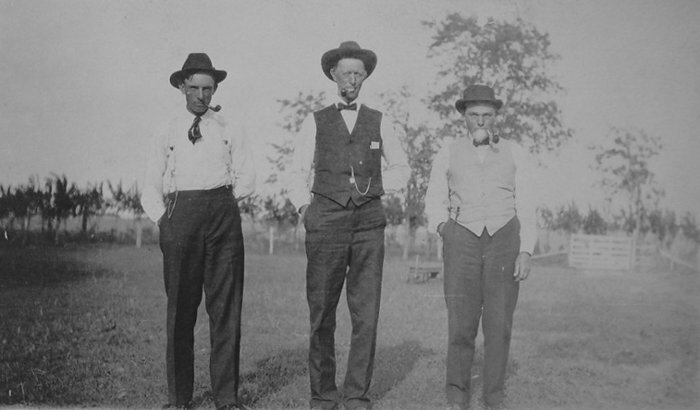 Consequently, each one of these pipe smokers is a brother-in-law to the other two. All of which hints at the real power of the unseen female presence. It may also suggest that if marrying into the Starkebaum family does not drive you to drink, it may cause you to take up another habit. These are clearly matters which require serious consideration and further research.